Enlarged isometric diagram of Lorica Segmentata "Corbridge" Armor Type-A. This style of armor or cuirass is composed of four basic assemblies - two "collar-shoulder" halves and two "torso-girdle" halves. Note that all the components are connected by leather straps and buckles. This was the first style of lorica segmentata armor and was the most comfortable to wear. 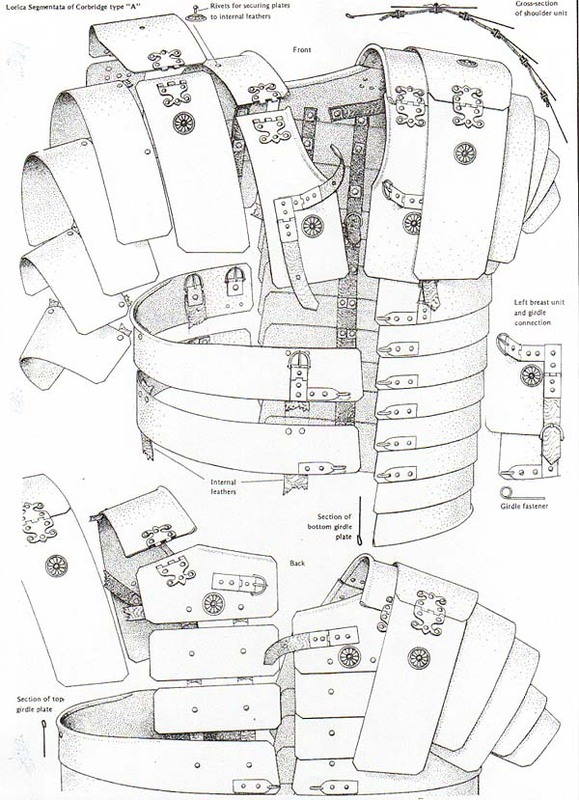 It was also more complicated and difficult to assemble; being composed of about 40 separate plates - 24 in the collar and shoulder units and 16 comprising the torso-girdle section. The later adopted "Corbridge" Type-B armor; utilized one less set of girdle plates (7 instead of 8) and had bronze hooks and eyes in place of the weaker and more fragile vertical straps and buckles which secured the shoulder portions to the girdle sections on the Type-A. Lorica Segmentata "laminated" type body armor was adopted by the Roman Legions in the early part of the First Century AD and was in use into the early Third Century AD, when it fell out of favor. This type of armor was particuarly protective against slashing and pearcing weapons; as opposed to the earlier Lorica Hamata chain "ring" maile type armor; which was only marginally defensive against long-pointed swords and arrows.